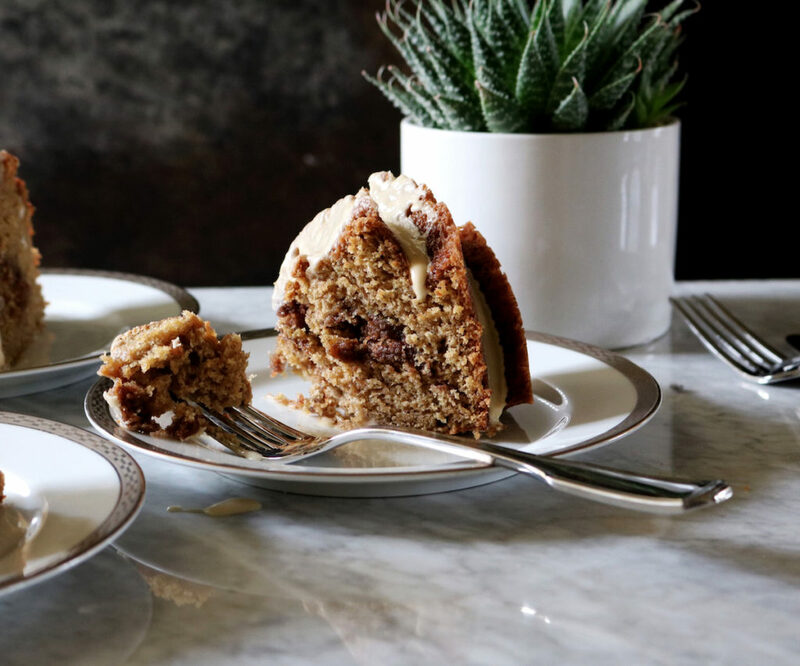 Is it a cake that tastes like Irish coffee or is it a coffee cake with Irish coffee vibes? Or are they the same thing? I think they’re different but this seems like more of an in-person conversation for us to have…perhaps over Irish coffee and cake? 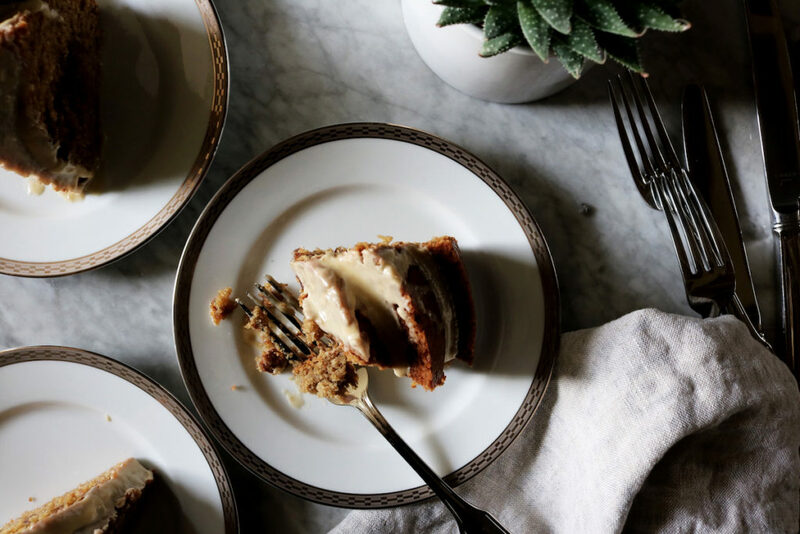 Today we’re scenting a traditional coffee cake with all of our favorite flavors: fresh-brewed espresso (or coffee), Bailey’s Irish Cream, streusel, boozy glaze and hella spices. I love spices, don’t you? This time I reach for cinnamon and cardamom. And Irish coffee cake isn’t coffee cake without streusel. I can tell you agree with me on this. Lastly, as if we weren’t getting all kinds of Irish coffee feelings already, we drizzle the whole lot with a Bailey’s glaze. Because. Glaze. And booze. Can we pause for a second and talk about the bundt pan I used? Holy smokes. I’ve been eyeballing her for awhile and finally splurged and haven’t looked back. I absolutely love it. I think you should get one. You deserve it. You’ve been working hard and sometimes buying something gives us an extra step in our walk. Some say that’s not healthy. I call it the reward system we’re all raised on. It’s fine. Eat some cake. Gavin won’t touch coffee cake because he thinks there’s coffee in it and even though I assure him my coffee cake doesn’t have coffee, he still won’t touch it. 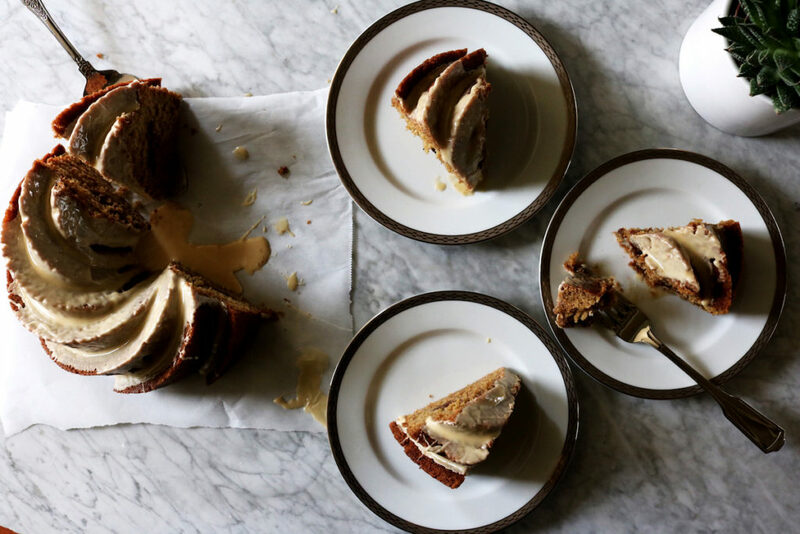 This Irish Coffee Cake recipe has completely blown that argument out the window. I’m starting to think he just doesn’t like cake to which I am absolutely not ready to accept that fate. How could it possibly be?!? My parents recently did the whole DNA testing thing and it turns out, I am a hell-ton Irish…as if my propensity towards red, alabaster skin and affinity for whiskey and potatoes weren’t proof enough. Now we have actual proof. Now it’s legit and I technically don’t have to wear green on St. Patrick’s Day. Which in light of my glow-in-the-dark skin, why would you want me to? In celebration of all of this, I made this cake for us. I don’t know if you’ve noticed but St. Patrick’s Day is looming…are we seasoning our corned beef already? Sifting through Irish soda bread recipes? Stocking up on Guinness? How many more clichés can I throw your way? Any who, I hope this cake will be your treat. Because every good holiday deserves a proper treat. I know you agree on that, otherwise you wouldn’t be here. I’m feeling very stream of consciousness today…are you picking up that vibe? And I’m going to have to start paying each and every one of you $.25 every time I type ‘vibe’ from this point forward. The abuse is simply unacceptable. OK, enough of that. 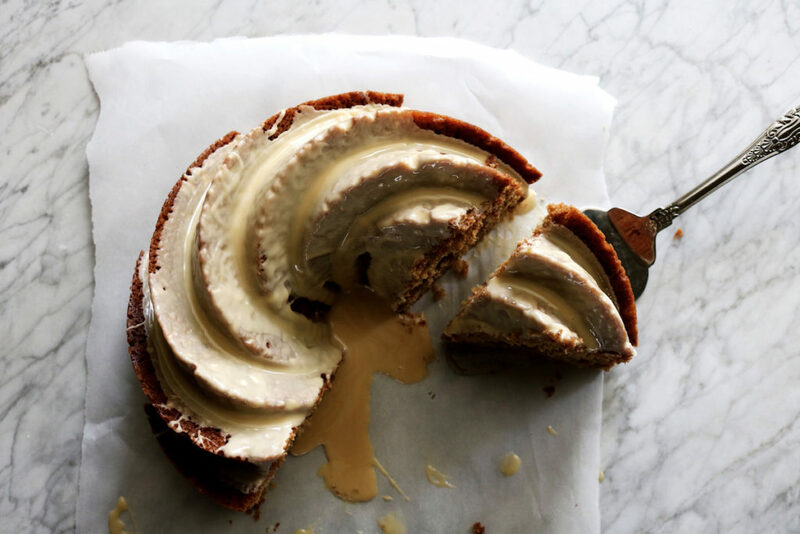 Let’s get our Irish Coffee Cake bake on! 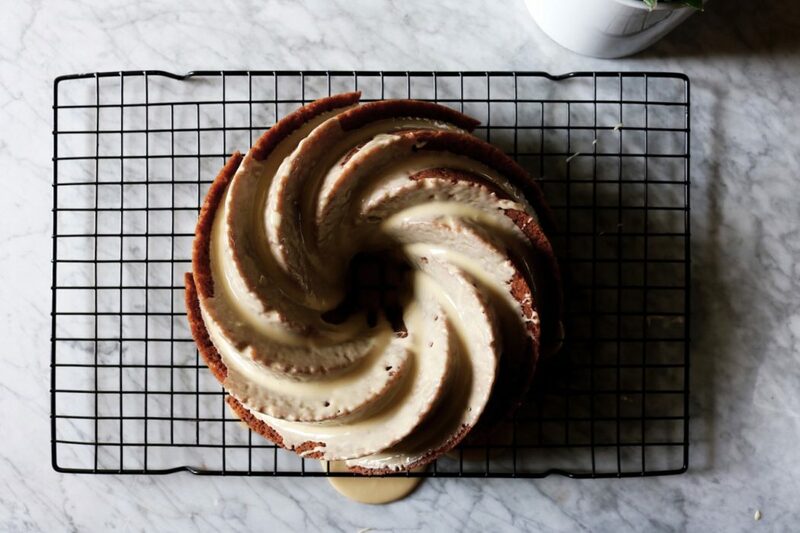 Heat your oven to 350 degrees F. Grease (butter + flour) a 10-cup Bundt cake pan. Put the butter, brown sugar and granulated sugar in an electric mixer with the paddle attachment and beat for about 4 minutes or until nice, light and fluffy. Add the eggs one at a time, on a low speed, and blend until mixed. With the mixer on low, slowly add in the sour cream, espresso, Bailey’s and vanilla. Be sure to scrape down the sides and bottom of the bowl to make sure everything is incorporated. Take the bowl out of the mixer. In a medium bowl, whisk together the flour, cornstarch, baking powder, cinnamon, cardamom, baking soda and salt. Sprinkle the flour mixture on top of the butter-egg mixture and gently stir until just combined. In a small bowl whisk together the streusel ingredients: flour, granulated sugar, brown sugar, cinnamon and cardamom. Add the butter and blend it into the flour mixture until it has the consistency of wet sand and there are no visible butter chunks. Pour half the batter into your prepared bundt pan. Sprinkle the streusel over the top of the batter and then pour the remaining half of the batter over the streusel. Bake in the center of the oven for about 40-45 minutes or until a toothpick inserted into the middle of the cake comes out clean. Let the cake cool completely before taking it out of the pan. When ready, invert it onto a cake plate. If the cake resists coming out, turn it back over and let it cool some more. Depending on what type of bundt pan you have, you could run a knife around the edges to help it release from the pan. In a small bowl whisk together the powdered sugar and Bailey’s. The mixture will be super thick…add additional Bailey’s in 1 teaspoon increments until you get to the correct consistency. You want it to drizzle down the sides of the cake, but you also want some degree of thickness so that it sticks to the top of the cake. Be sure to tag @displacedhousewife #displacedhousewife so I can see your cakes!! Stella is having one HELL OF A TIME getting over mono. She’s exhausted. I started her on some herbal stuff (Cat’s Claw, Olive Leaf (this is disgusting) and Oregano)…do you have any other recommendations?? This is honestly so upsetting to me. I’m excited to relax on Sunday and read this! I love to look at these 360 videos at the NY Times website. Let’s have dinner here. We started allowances in our house and I had the kids come up with a list of things for them to do and Gavin sent me the list with the subject heading: Gimme Dat Money. Yep. I suppose that’s a good note to end on. Sending you all heaps of love + light!!! The cake looks amazing! I’m going to try it this weekend. just wondering if it’s better to be made the night before or the morning of serving it? 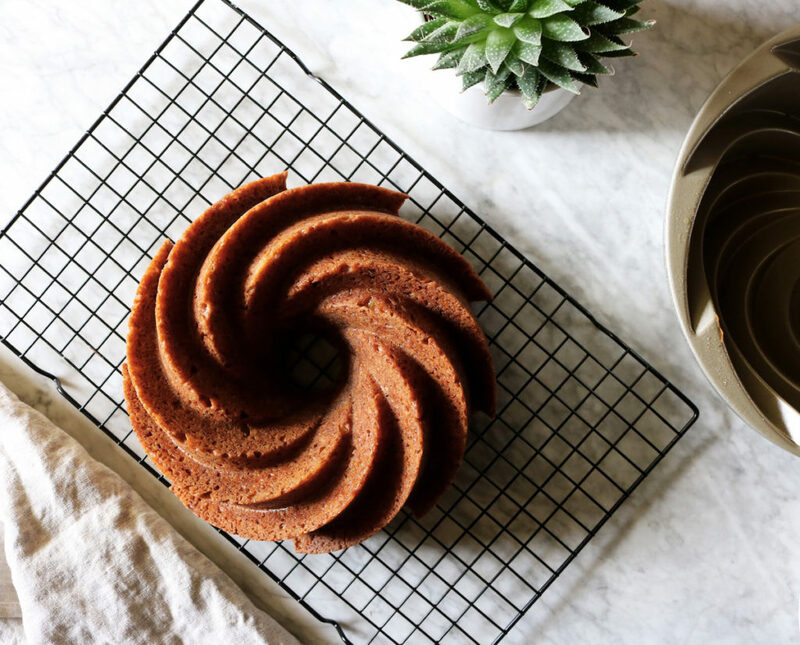 That bundt cake pan is amazing! I have to get one ASAP. It really steps up the “baking vibe” haha I love your verbiage. Seriously just irish and coffee makes me crave for this crazy yummmmm cake. I can’t wait to make it sometime, you know my weakness for my South Indian coffee. Might use that in this cake. You are giving me all kinds of ideas. Such a beauty – I mean that glaze, tho! Major heart eyes over here. xo! From one Irish lady to another – these looks hella delicious. I can’t say that word without thinking of Taylor Swift. Must be obvious I have a tween girl. Love all the flavors going on in here and I must have that pan…like now! Srsly! This is so gorgeous. The light. The styling. I love, love, love. I have several bundt pans Rebecca, but I have to say that one is my fave. It’s just so stunning on the serving platter. On to Gavin…what the?? No coffee cake? And perhaps no cake altogether? Someone’s got to talk some sense into that child. I know he likes his pizza, I’ll cut him some slack for that, but no cake? Hopefully things will change. Wish I lived closed because I’d help you finish this one off with no problem at all. I’d want to put that Bailey’s glaze on everything! And I just love the cardamon in the cake and it the streusel! This one’s a winner! Wow this looks amazing. I can’t wait to make this. All this gorgeousness!! Love all the spices and that you actually put coffee in the coffee cake. Also, I need this bundt pan! This looks fantastic! I’m dying to get that pan. i’m digging coffee cake and coffee-flavored cake and coffee-flavored coffee cake, so this sounds delicious. also: hoping your son grows out of his anti-cake phase. my brother used to be anti-cake but loved cupcakes (no idea why…. ), so anything can happen. maybe.